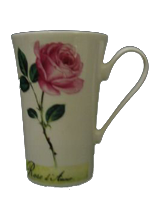 What does a Roy Kirkham “Rose D’amour” china coffee mug and a box cutter have in common? Do you struggle to open vacuum packaged meats? I hate those packages. Perhaps I am uncoordinated or just crazy but I always struggle opening those darn things. Being a fast moving person (coffee addict) makes matters worse for sure. There I was at the kitchen counter, late again starting dinner. Of course, tonight there would have to be a fight with the package of pork chops, I am behind schedule, and I can not for the life of me cut this package open. My knives are far from professionally sharpened and they will slice through a thumb or finger just not this plastic packaging. Being behind schedule, in a rush, and aggravated by this plastic packaging, with great force I gave the package one more side swooping slice and SMASH! The knife not only sliced the package open but also continued into my favorite Roy Kirkham coffee mug, breaking the top half clean off. I let out a gasping scream followed by a few choice words and a deep breath. I said, thinking aloud, “Oh my gosh, besides being my favorite mug, that was a gift from my late mother in law!” Hearing my dismay, he joined me in the kitchen. He knew I was heartbroken as I shared the memory of mom telling me that every time she bought me a mug she bought one for herself as well. His brother is living in mom’s house now and largely her house wares are still in place. Hubby encouraged me to give him a call. Lo and behold, my brother in law arrived for the Labor Day barbecue with my favorite mug replacement. This incident has obligated me to solve the plastic fighting dilemma without giving up my coffee. The kitchen will now be equipped with a retractable box cutter tool. No more broken coffee mugs for me… there is not another replacement.